Apartment Building, Commercial and Residential Real Estate state of the market video from Tom Barrack of Colony. 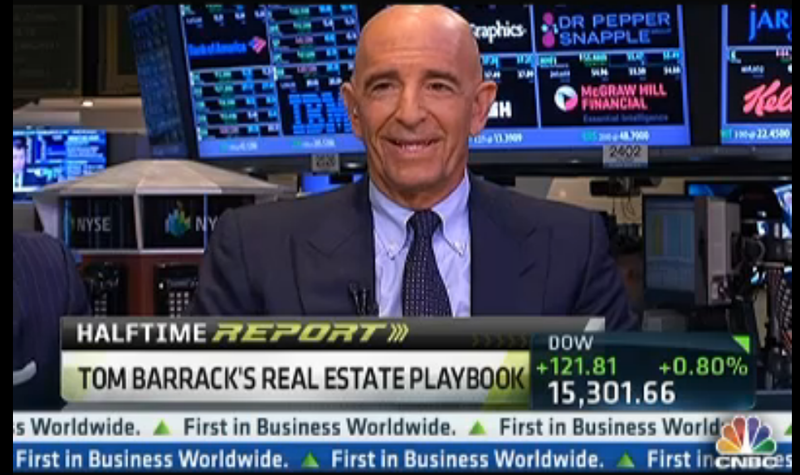 Tom Barrack was on CNBC last week to talk about real estate with the traders. Great TB quote to open the show: “It’s always great to be the slowest guy on Fast Money”. There’s more wisdom in that statement than any of the show’s regulars understood. Housing [of all types] is the best opportunity. Today there might be a Fed bubble but there isn’t a housing bubble. The rise in interest rates while not big and still low historically speaking, will hit entry level housing. 100bp (basis point, where 100bp = 1%) rise in interest rates will cost a borrower an extra $150+/- a month on their mortgage payment for a $200,000 home. That will keep more people renting. Tom says the amount of pent up demand for new homes, existing homes, rentals and apartments is Continue reading Apartment Building, Commercial and Residential Real Estate state of the market video from Tom Barrack of Colony. Posted on June 24, 2013 July 2, 2013 Categories Commercial Real Estate, Multifamily Investments, REOs to Rentals- Single Family, Tom BarrackTags Apartment Building Investing, apartment demand, Blackstone, Colony Capital, commercial property, CRE, finished lots, home builders, housing affordablity, Housing demand, interest rates, investments, land cost, mispricing, mortgage interest rates, supply, Tom Barrack, trends, value investingLeave a comment on Apartment Building, Commercial and Residential Real Estate state of the market video from Tom Barrack of Colony.